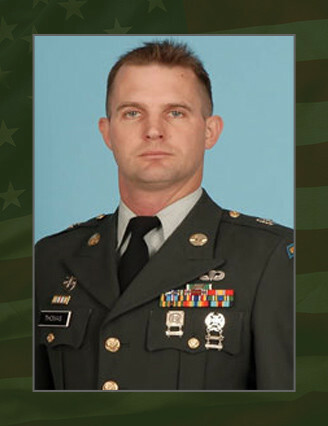 Staff Sergeant Michael D. Thomas was born on November 29, 1972 in Athens, Ga. He was a weapons sergeant assigned to 1 st Battalion, 7 th Special Forces Group (Airborne) at Fort Bragg, N.C.
Thomas died April 27, 2007 from wounds sustained while conducting a combat patrol south of Shindand, Shindand District, Herat Province, Afghanistan. He deployed in support of Operation Enduring Freedom in Mar. 2007. A native of Seffner, Fla., Thomas enlisted in the Army Jan. 22, 1991 as a military police officer. After completing advanced individual training at Fort McClellan, Ala., he was assigned to Camp Casey, Korea. During the next 13 years, he served in positions of increasing responsibility within the Military Police Corps eventually becoming a squad leader. In 2004, Thomas volunteered for Special Forces training and upon completion of the Special Forces Qualification Course in 2006, he was assigned to 7 th SFG (A) as a Special Forces weapons sergeant. Thomas’ awards and decorations include the Army Commendation Medal, Army Achievement Medal, Good Conduct Medal, National Defense Service Medal, Korean Defense Service Medal, Armed Forces Expeditionary Medal, Global War on Terrorism Expeditionary Medal, Global War on Terrorism Service Medal, NCO Professional Development Ribbon, Army Service Ribbon, Overseas Service Ribbon, Parachutist Badge, and the Special Forces Tab. Bridwell and her husband Jaye, sister Cassie Kirkpatrick and Aunt Cheryl.